We noted last week that Apple Podcasts might launch a web browser version of iTunes Podcasts (or, similarly, the Podcasts iOS app). At that time the launch seemed incomplete, and some publications which had reported a full launch retracted their reporting. Now it seems like a full-on web product — not of Apple Podcasts as a whole directory, or a replacement of iTunes — but individual shows now present within the web browser with descriptions and episode play. This represents a monumental step forward for Apple, and for show owners who link to their Apple locations in podcast promotions. Those days appear to be over. Program pages now present an attractive rundown of the show’s logo, description category, and playable episode list. 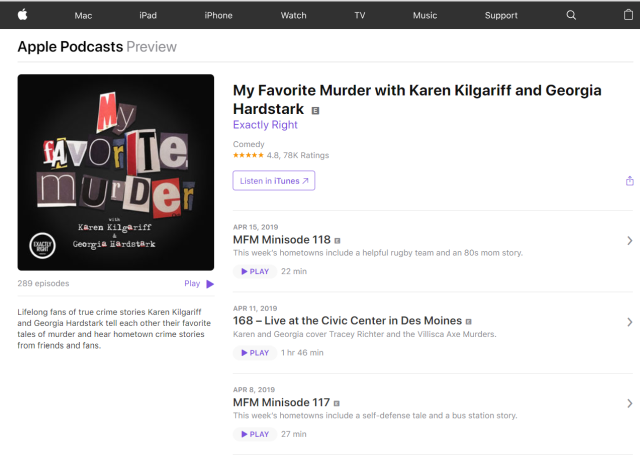 For the first time, Apple’s status as the largest podcast distributor is justified in web browser view, and producers can address the entire listening market with Apple links.